I received the death certificate for my 2nd great-grandmother, Leaty Caroline (Lankford) West several months ago, but have just gotten around to analyzing it. As far as death certificates go, this one does not offer a great deal of new information, but it does confirm a lot of pieces of data and provides a primary source citation; moreover it doesn’t create any conflicts with prior information. She was widowed, which supports the prior death date for her husband. She was born in Tennessee. I had hoped for more specific information, such as a town or county. Oh well. Her father was Wyatt Lankford, who was born in Georgia. Her mother’s name is reported as “Litha Bruer.” The 1850 census reports her as “Tobitha,” and the 1870 census reports her as “Talytha.” Litha makes some variation of “Talytha” more likely, I think. It also goes along with Leaty’s name. Her birth year is reported as 1848. I have numerous implied birth years for Leaty, ranging from 1848 to 1860. She resided in Cisco, Georgia when she died. The informant on the death certificate was H. Lankford; this is probably a brother or maybe a nephew. Why wasn’t one of her children the informant? She was buried on 21 February 1937 and the funeral arrangements were handled by Kenemer Brothers Funeral Home of Dalton, Georgia. 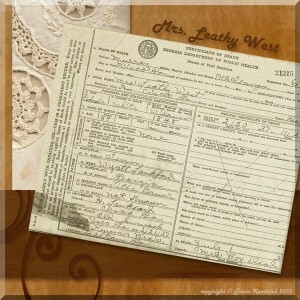 Check Tennessee marriage records for Leaty and William West. Try to nail down which family is Leaty’s on the 1860 census. I have two possibilities. Perhaps by researching the other household members, I can reach a conclusion. I like how you break down documents like this followed by a to do list. I do this but don’t tend to do it on my blog. Hmmm, another great idea. Thanks.